Not many late-round draft picks come in to the game and succeed right out of the gate. Even fewer hit above .300 across four different Minor League levels in their first two professional seasons. 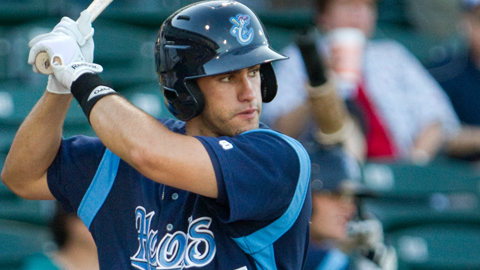 However, 23 year-old Corpus Christi Hooks outfielder J.D. Martinez has done just that, and it doesn't appear as if he's slowing down one bit as he continues his climb towards Houston. After being drafted by the Astros in the 20th-round of the 2009 draft out of Nova Southeastern University in Davie, Florida., the 6'3" 220 pound outfielder burst on to the scene, hitting .403 with five home runs and 23 RBIs in 19 games with the Greeneville Astros of the Rookie-Level Appalachian League, then .326 with seven home runs and 33 RBIs in 53 games after being promoted to the Tri-City Valleycats of the Short-Season A New York-Penn League. Proving his rookie season was no fluke, in 2010 he hit .362 with 15 homers and 64 RBIs in 88 games with the Lexington Legends of the Low-A South Atlantic League, before getting the call up to AA Corpus Christi, where he hit .302 with three home runs and 25 RBIs in 50 games. How is it that a player can continue to put up such a high batting average while quickly moving from one level to the next? Well, as Martinez puts it, it takes a little help. "I think it's just been by training every off-season with my hitting coaches in South Florida," said Martinez. "I have a great relationship with (former major leaguers) Paul Casanova and Jackie Hernandez. They've taught me everything I know about hitting and baseball since I was 12. From working with them I've built a confidence at the plate that really translates at any level." That confidence and ability has not just amounted to exceptional numbers at the plate, but also a bit of hardware and recognition. Just last season, Martinez was awarded the Astros Minor League Player of the Year, South Atlantic League Player of the Year and South Atlantic League MVP, as well as being named a mid and postseason South Atlantic League All-Star. "It's definitely nice to look up and see that I have those awards," Martinez said. "It was an honor to receive all of them, because it shows great recognition of the things I've accomplished as a player. But at the end of the day, being able to move up and help teams win is more meaningful to me. I just want to become more and more of a prospect in the Astros' eyes." J.D. is already quite the prospect, ranking as the sixth-best in the Houston Minor League system. While there's never been any question as to whether or not he could handle a bat, some scouts have knocked Martinez a bit for his defense in the outfield. "Well when you get drafted in the later rounds like I did, it's always because the scouts see something they don't quite like," said Martinez. " I'm not a five-tool guy, few are, but in no way am I going to drop balls out there. The Astros know I can play defense, and I've been working with Milt Thompson, our roving outfield instructor on my routes to fly balls. I'm confident that I can get to balls now, and the Astros have noticed I've improved out there." With his continued development, it may be only a matter of time before J.D. gets his shot with the Astros. Yet, despite the big league club's struggles, Martinez keeps his mind focused on the task at hand; helping the Hooks win. "That's something you just don't think about. Right now I'm here with the Hooks and I want to help the Hooks win. Getting up to play with the Astros is the ultimate goal, but in the meantime, I've just got to worry about my role here. I know that if I keep working hard and continue to put up good numbers, that eventually the guys up there won't be able to turn their back on me." With Martinez hitting .321 with three homers and 31 RBIs through his first 31 games of 2011, it's quite conceivable that the Astros are keeping more than one eye on him, believing that the Martinez era is well on it's way to Houston.